We review the quick playing card game Final Touch, published by Asmodee Games. 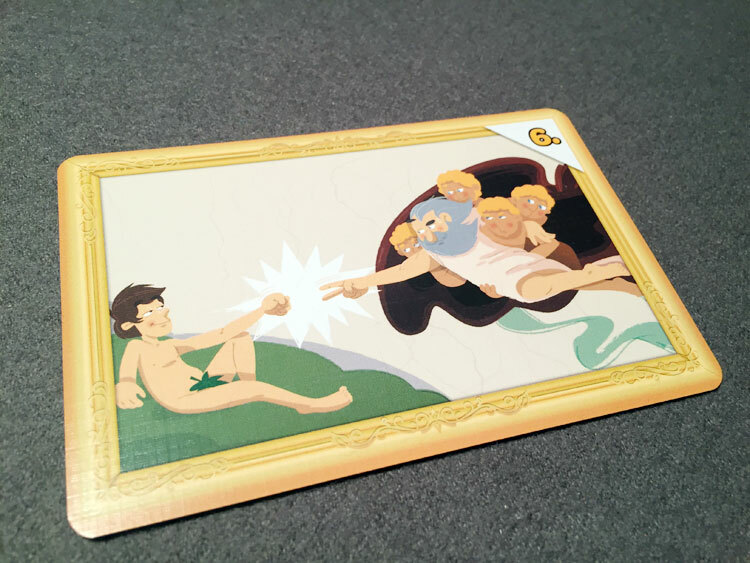 In this filler game, players are trying to be the last player to play a card, completing a painting and thus earning the points for it. Here is a little known fact about me you might not know. My college degree is a BFA in Painting. I know, not the most lucrative of fields. But hey, you gotta follow your passion right? Now-a-days the only painting I do is of the miniature variety, but I still enjoy a good game about art. Today we are going to look at the light card game Final Touch, by Asmodee Games. 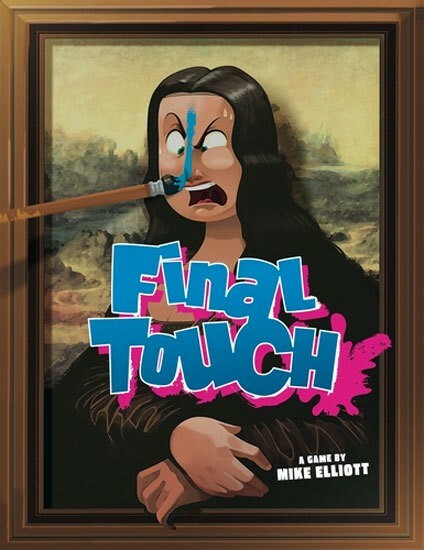 Designed by veteran designer Mike Elliot (Marvel: Dice Masters, Shadowrun: Crossfire), Final Touch will have you working against your fellow players to complete paintings to earn points. So let’s break out our brushes and pallets and see if this card game is worth a spot in your game library. 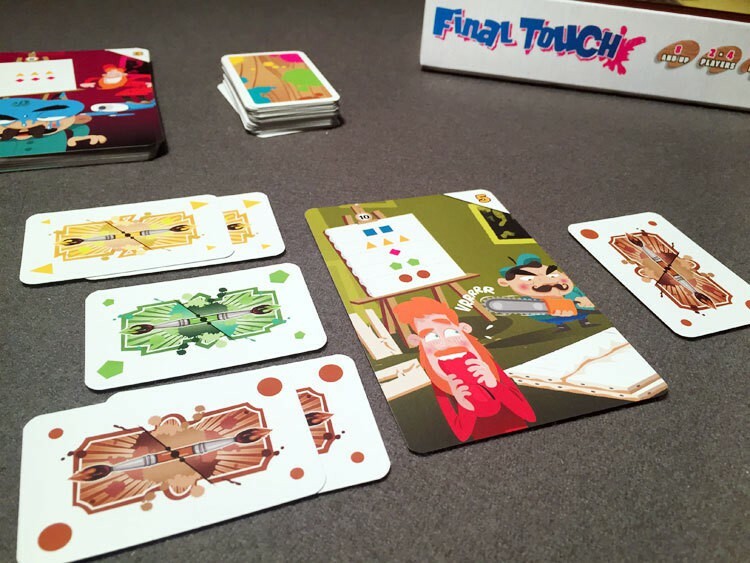 Final Touch is a hand management card game for 2-4 players that takes about 15 minutes to play. Final Touch plays well at any player count. There are five different paint cards. The components in Final Touch are simple, yet still well designed. The box is small enough to easily fit in a bag for travel, yet it is also one of those games where the box is bigger than it really needs to be (I’m looking at you Splendor). Included in the game are two decks of cards. The color cards come in 5 different colors and are used to complete paintings. The deck of painting cards are dual sided, with the work in progress side showing the exact combination of colors needed to successfully finish a painting. Overall the cards are of high quality, and feature some well done, cartoony artwork that definitely fits with the theme of the game. The finished “paintings” in the game are parodies of famous works of art, such as DiVinci’s Mona Lisa or Magritte’s The Son of Man. Learning to play Final Touch is very simple. 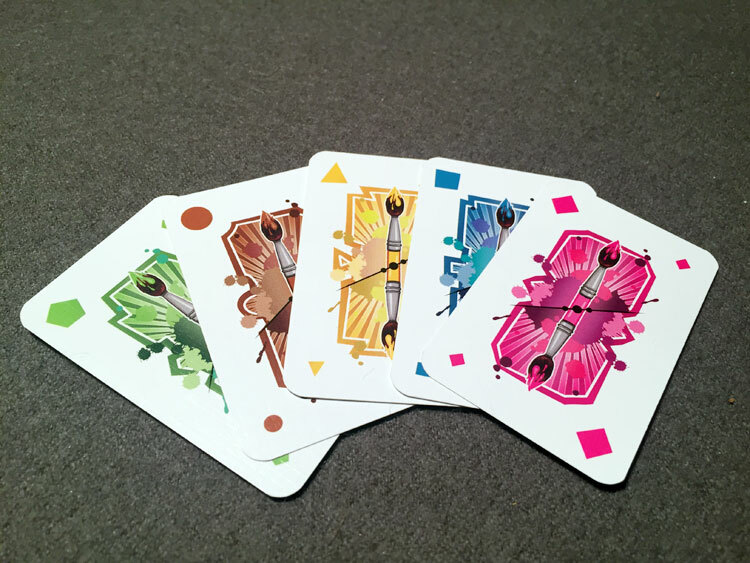 Each player starts with a hand of 5 color cards, and one painting card is drawn into the middle of the table. Note: the stack of painting cards are face up, so players can see what the next card will be. Smear cards are any colors not used (or already filled) for a painting. Improve the painting: Each painting requires a specific number of color cards to be played to finish it. To improve a painting, simply play any number of cards to the painting, as long as they fill an open requirement. So if a painting requires 2 blue and 1 green card, you can play 1, or even all 3 of those (assuming they haven’t been played already). Smear the painting: Play any ONE card to the other side of the painting. It must be a card that the painting doesn’t require (either because it doesn’t need it, or it’s already been filled). If a player is able to complete a painting by playing the last required card the painting needed, they flip it face down and add it to their score pile. 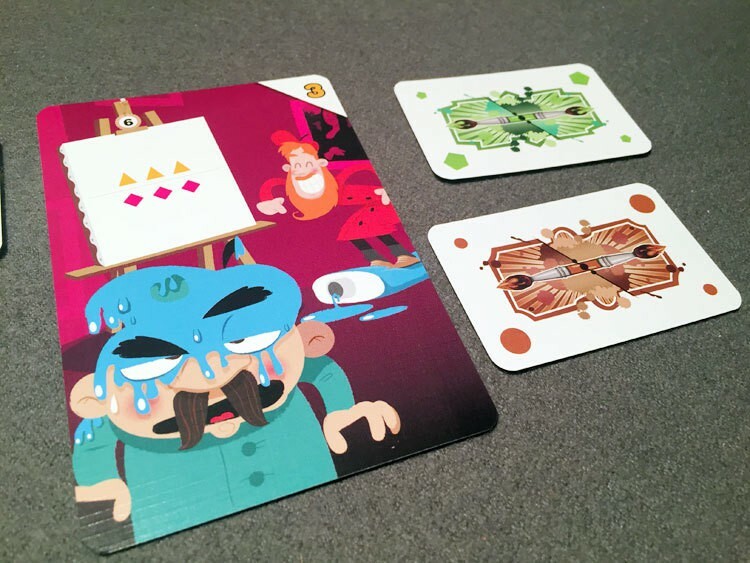 If a player plays the 3rd smear card to a painting, it’s ruined and their opponent takes the card face up into their score pile (earning only half the points a finished painting would have earned). In either case, the next painting card is drawn to the table and the active player takes another turn immediately. The first player to 25 points wins the game. A player can play as many paint cards to the left side as they want on a turn. Final Touch is the bench mark for the old rule of not reviewing a game after just one play. To be completely honest, after my first game, I thought Final Touch was dumb. It seemed fairly random and almost as if the game plays you. Add cards to the painting if you can, hope you play the last one. Meh. After our first game ended unceremoniously with a random winner, we decided to give it a few more tries. And sometime in the next game or two, things started to click for me. There is actually a lot more going on here than meets the eye. Final Touch is one of those games that’s super easy to learn, all the while it devilishly hides its depth. There is so much more that needs to go into your decision making than just playing all the cards you can. All paintings in the game are parodies of famous works of art. For example, if a painting needs 7 cards to compete, and I have 5 of them, I could dump my whole hand that turn filling requirements. However doing so, will not only make it much easier for my opponent to complete the painting, but leave me at the mercy of the draw for what I have to play on my next turn. Players earn nothing for partials. I could play every card a painting needs but one, and if my opponent plays the last one, they earn all the points. So what’s a player to do? That’s where the strategy comes in. I like to leave myself with as many options as possible, especially early on. This means not only playing fewer cards, but also trying to read my opponents to gauge the strength of their hand. Yet as a card game, you will still be at the mercy of the draw deck. Sometimes you are going to draw a hand of all blue cards. That’s life. And that’s where the smear comes in. If you see your opponent marching towards completion, you can ruin the painting, costing them half the points they would clearly have earned. And when it comes to ruining, I also like to try and force my opponents’ hand. Since each painting can take 3 smears, I like to drop one down early, even if I have improvement cards that could have been played. If you can trap an opponent and force them to play the final smear card, they are handing you easy points. Plus, since the draw pile is face up, even if you have a crappy hand for the current painting, you can plan ahead for the next round. Completed paintings are turned over and the player who played the final card gains the points. As you can see, there is much more depth here than meets the eye. I’ve just gone into a few basics of strategy, and this is for a quick, 15 minute game. I can’t remember the last time I was so wrong about a game after my first play. But I’m big enough to admit it when I was wrong. I think Final Touch will make a great gateway game for new players. If you have friends or family members that are still playing Rummy or Uno, this could be a great game to introduce them to the hobby game market. It’s colorful, accessible, and even has a fun theme. Finally, I enjoyed the player scaling in Final Touch. 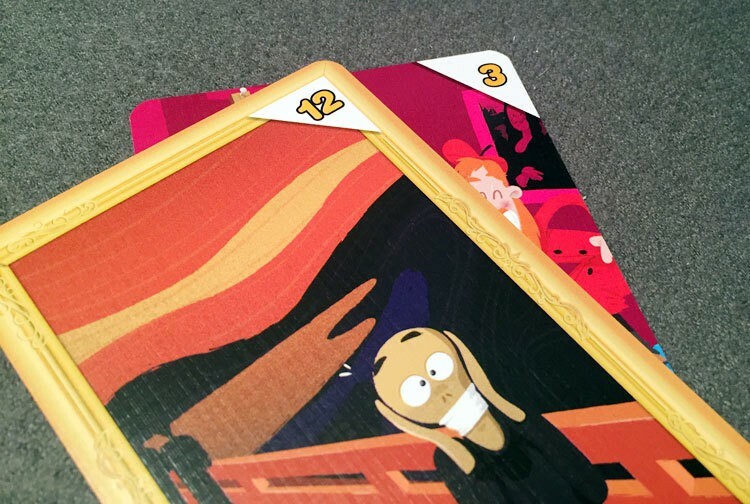 With 3 players, both your opponents have to share the smeared card’s point value, so you have to be aware of each of their current scores if you are smearing a piece. And with 4 players, you play in teams, which was a lot of fun. Final Touch definitely flew under the radar for me and I was surprised with how much I ended up enjoying it, especially after my first game. Below its highly accessible ruleset lies a game with a surprising amount of depth. Not only will you need to plan for future turns, you also need to read your opponents and try and figure out what they will be doing. Hand management is a very important part of this game. There is a lot to love with this great little game. I think Final Touch makes for a filler game that can be enjoyed by gamers and non-gamers alike, and its portable nature makes it easy to toss in your gaming bag as a last minute additions. If you’d like to pick up a copy of Final Touch, you can get it for about $15. 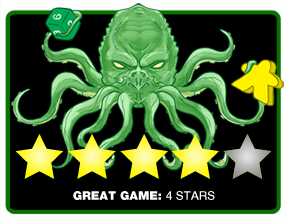 Final Score: 4 Stars – A great filler game that surprised me with its hidden depth and fun game play.